In previous blog post we’ve learned, that the RfP 2.0 doesn’t work with complex tenders . What we all assumed is underlined with facts. We can’t predict, nor estimate the unknown and so we can’t specify the scope without creating waste. We would need so much time for investigation, that we already could start probing iteratively. Furthermore, we’ve learned to focus to the end user/customer needs, constantly validate those and look for a future-proof partner instead of a predefined solution. If we don’t reinvent RfP 2.0 fundamentally we might loose more and more potential partners interest and with that we’ll also loose opportunity for unexpected innovations and so a potential competitive advantage. All this leads us to the conclusion, that we need a major upgrade of the RfP, the RfP 3.0!-An upgrade, that fosters collaboration and innovation. We call it „Request for Participation“. But how does it look like? The fundament of a partnership is trust and transparency. Have you noticed?-We’ve said partnership instead of relationship, that’s the first fine but big change with RfP3.0. In an ideal world we would just choose a partner and start probing iteratively. Unfortunately, our current culture and believes are not yet there. So we need something in between. The funny thing with trust is, it works in both ways. This often gets forgotten. In other words we need to establish trust and reduce risks for both sides (buyer and partner) at the same time. Therefor we can create sophisticated agile contracts, that describe and handle collaboration, scope, timing, budget, quality, warranty, etc. Personally, I don’t believe in that way and I’m more with Marco Zoppi. Sure, we have to manage the basics in a contract, no doubt. But I’m a strong believer in the good idea of men (theory Y, source 1) and we should not punish the majority, because of some few bad theory X cases from the past. By the way, Niels Pflägin said: "There are NO X-er by default, the system / organisation makes them behave like X-er". Instead we should find lean and agile cooperation models and -contracts, that are fair and foster trust by e.g. So that the partnership stays adaptive instead of fixed. In my opinion, that’s true agile contracting!-But that’s another story. Currently agile is the only approach we know, to deal with complexity. Its built in approach of build <> measure <> learn brings us iteratively towards the right solution. For the RfP 3.0 this means, that in complex tenders for innovation, business services, ICT, etc. it makes no sense any more to think off solutions (features / functions) or wants in advance. Instead we need to focus on the customer needs and with whom we could solve them best. All this is a creative development, that we only could achieve in a participative approach. The potential partner and all stakeholders from both sides (business, executives, lawyer, buyer, customer / user, developer, etc) need to be involved at once. YES, that means we do this all together in ONE room. This allows both sides to align with the customer needs, but also check if the partner is future proof, if we have a culture-/technical match (soft-/hard skills), etc. Only with this participative, creative development we will create real innovation and get first validations with the stakeholders available. Further advantage of this approach is speed (Time-to-Market). If we get all stakeholders in one room we can immediately decide and achieve results in DAYS instead of Months. We see this from other examples, like e.g. Design Thinking, Hackathons, etc. where time-to-market was improved with such a participative approach dramatically. But how can we cope with this uncertainty of an „unknown“ solution (scope gets variable)?-Well, there are other disciplines out there, that face a similar challenge. If we think about business development they’ve used to write big business plans and switched over to the business model canvas (a structured page that describes a business model, source 2) and lean startup (an agile approach for early validation of the hypotheses with the customer, source 3). After ideation with the business model canvas it’s very easy to overtake the strategy (WHY) and the customer needs (WHAT) and add the timing (WHEN), the people (WHO) and the conditions (WHERIN) within hours. With this we have the basic informations to start a participative event with one, or multiple potential partners. On this joint event we workout, whatever is valuable for us to decide starting an adaptive partnership. We could work out together more concrete customer needs and appropriate solutions, an agile roadmap of the next stage, etc. Basically we complete together the procurement canvas and decide. What counts for a business model and in more details for the customer needs counts also for a partnership. Instead of loosing time in non-valuable work we start as early as possible and constantly validate the joint achievements stage by stage and so the partnership. 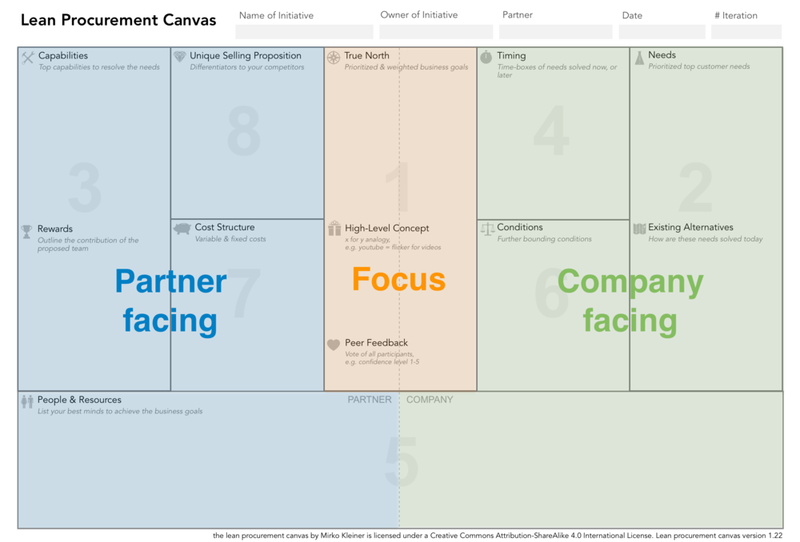 Therefor the lean procurement canvas becomes the tool for management of your adaptive partner ecosystem. It turned out, that the lean procurement canvas can be used in all areas and industries, that have to overcome complex tenders, adaptive partnerships, etc. We get increased business value with RfP3.0 (increased time to market, reduced and distributed risk, incremental and value-added funding, improved business outcomes, etc). But for us most important, with the participative approach of RfP3.0 we’ve seen returning fun in the faces of all stakeholders! If you’ve got infected by the approach RfP 3.0 ‚Request for Participation‘ feel free to share your opinion and/or similar cases with us. More detailed information about the approach, success stories, the community, upcoming workshops and talks, etc. you’ll find under http://www.lean-agile-procurement.com - Stay tuned!